A group of Oakland students is hoping to make a splash with a new trivia application they developed to raise awareness about California’s drought. The students built the application as part of Youth Radio Interactive, a programming and journalism initiative associated with the Oakland-based media production company Youth Radio, which educates students on interactive storytelling. 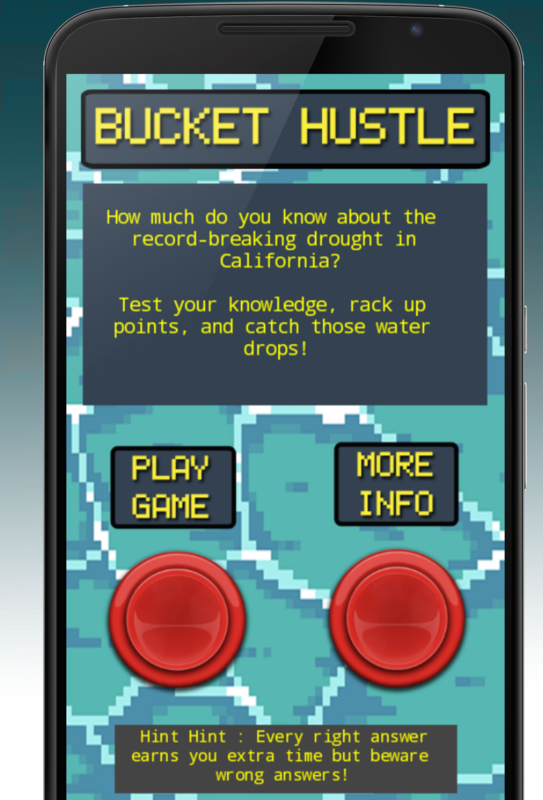 Called "Bucket Hustle," the Android app features a game in which users must catch virtual raindrops and answer as many drought-related questions as they can within 45 seconds. The group wanted to find an engaging way to spread knowledge about the drought, said Asha Richardson, co-founder of Youth Radio Interactive. “We know we’re in a drought, but what does that actually mean?” she said. According to Richardson, it took only two days to make the prototype. Eight students worked on designing graphics, coding, producing music, and creating trivia questions with Youth Radio Interactive students Storm White and Eli Arbreton acting as the design and programing leads, respectively. After creating the prototype, it took several months to flesh out and fine-tune the app — fixing bugs and conducting a pre-launch — before the final version was ready to be downloaded last month. Youth Radio Interactive does not require prior programming experience of its participants. The students built the application using the MIT App Inventor — one of the program’s partners — which Richardson said was particularly useful for beginners looking to get their feet wet in programming. "Young people actually get to make real things," she said. "The critical thinking skills [they learn] are going to transcend any programming language." Since its founding in 2010, Youth Radio Interactive has produced a range of web projects and applications. Their projects have included an app designed to facilitate the sharing of free food in the community, and an interactive page detailing stories of police officers mistaking various objects for guns. Youth Radio also recently produced reports on the drought for National Public Radio and National Geographic.